Of all the pocket-sized pikes, the Asian killi is perhaps the easiest to keep. At around 3.5 inches in length, it isn't especially large, and can work as a community fish with a minimum of fuss. So while every inch a predator, it is only a threat to things like neon tetras and zebra danios. Gouramis, angelfish, Corydoras, and so on are perfectly safe. The Asian killi is very adaptable in terms of water chemistry requirements, inhabiting peaty swamps and slightly brackish streams all along the southern coastline of India. In aquaria, it can be kept successfully in everything from soft and slightly acidic through to hard, alkaline, and slightly brackish water. What they do need is an aquarium with lots of plants at the surface because these fish do tend jump when startled. Floating plants like Salvinia and hornwort, or long-leaved plants such as Cabomba and Vallisneria will inhibit this behavior, but even so, be sure and keep these fish in a covered tank. Asian killies are sold in two versions: a greenish wild variety and a golden yellow artificial form known as the 'golden wonder' killifish. The wild variety is fairly variably in coloration, but typically has a silvery-green body with a series of think vertical bands across the back half of the body. Females usually have thicker bands than the males, and the males tend to benefit from a few more yellow spangles on their bodies. Golden wonder killies are silvery-yellow around the head and lemon yellow on the body. 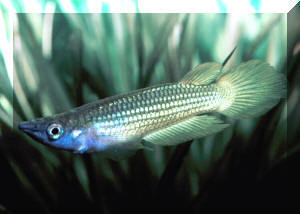 Some varieties have blue or green spangles on the body or red edges to the fins. 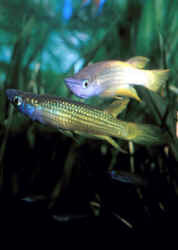 Asian killies are very pike-like in their shape and habits, despite their size. They do not like to be overcrowded, and males especially can be territorial. Though predatory, these fish will eat any small live foods that stay close to the surface: daphnia, brine shrimp, mosquito larvae, fruit flies, and so on. Frozen bloodworms are also enjoyed, though you may want to place these one at a time onto the surface so that the fish can get them more easily. If you're careful, the bloodworms will stay on the surface, and the killifish will snap them up eagerly. Most specimens also learn to take flake foods and floating pellets, and a convenient but healthy diet would consist of a mix of both flake and frozen foods.